As Michelle Cottle explained in a recent TNR piece, Sarah Palin has generally carried out a crafty and efficient strategy for intervening in 2010 Republican primary contests. In some cases (notably Iowa) she has simply endorsed a certain winner via Facebook from the comfort of her home in Wasilla, running up her winning percentage without much effort. In one case, she struck political gold: appearing with South Carolina gubernatorial candidate Nikki Haley precisely as attacks on her marital fidelity and ethno-religious background converted her into a Palinesque cultural martyr. But Palin hasn’t taken any really big risks, until this last week, when she endorsed former Georgia Secretary of State Karen Handel. Within hours, this action created a surrogate showdown with Georgia’s own Newt Gingrich, who endorsed (in person, and in Georgia, not on Facebook) his former House colleague Nathan Deal. This could not have come as a great surprise to Palin, since Gingrich had already cut an ad for Deal and spoken warmly of him even as the Georgia gubernatorial race became extraordinarily bitter. But Handel was just too tempting an endorsee for Palin: like Haley, she’s cast herself as a “conservative reformer” taking on the corrupt “good ol’ boys” of Georgia politics, and was already rising in the polls towards a runoff spot. Palin’s intervention clearly fired up the other candidates. With just days to go before the July 20 primary, Deal has gone after Handel with a clawhammer of an ad, scorching her for alleged former membership in the Log Cabin Republicans, the gay GOP group that’s about as popular among Georgia conservatives as an evening with Barack Obama. Meanwhile, another candidate, former Insurance Commissioner John Oxendine sent out amailer calling Handel “pro-abortion” because of an public spat she had with the Georgia Right to Life organization over that group’s proposal to restrict IV fertility clinics. These are direct appeals to Palin’s social conservative base, so it’s not surprising she responded by recording a robocall for Handel defending her “pro-life and pro-family” credentials. And the atmosphere has long been poisonous, with Handel all but calling both gentlemen corrupt hacks. (Handel supporter Erick Erickson of RedState has vowed to vote for Democrat Roy Barnes if Oxendine is the Republican nominee. And the ethics allegations that helped chase Deal out of the House and onto the campaign trail earlier this year are a constant source of abrasive comment from the Handel camp). So far Gingrich has stayed out of the fray, but that might not last if the Handel-Deal competition goes into overtime and the anointed candidates spend three solid weeks shooting fiery arrows at each other. The last two polls released in Georgia show Handel and Deal poised to make the runoff (Insider Advantage has Handel first at 24 percent and Deal second at 16 percent—ahead of a fading Oxendine—and Rasmussen shows them tied for the lead with 25 percent each). With every Georgia candidate posturing as the “true conservative” in the race, it will be hard to read any deep ideological meaning into any particular result. 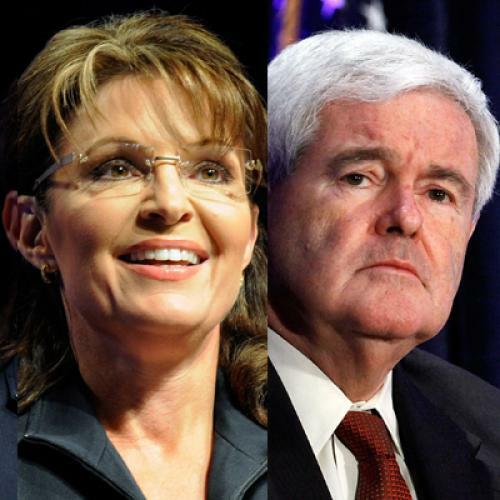 But we do know that both Palin and Gingrich have assumed large political risks here. If Palin’s candidate loses in part because of perceived heresy on cultural issues, conservative opinion-leaders might decide she’s straying too far from her original Right-to-Lifer base, as some former fans muttered when she endorsed Terry Branstad in Iowa over social conservative favorite Bob Vander Plaats. And just imagine the pain Palin would inflict upon the former Speaker (and his potential 2012 campaign) if her candidate beats his while she’s happily ensconced thousands of miles away in Wasilla, where you might be able see Russia, but not Peachtree Street.